Ex-National Security Agency Head Calls For U.S. Troop Withdrawal From Iraq | Democracy Now! An independent communications contractor missing in Iraq since early April was shown being decapitated by five masked Islamic militants in a fuzzy video posted on the Internet yesterday. The murder appears to be the first retaliation against the U.S. for the abuses suffered by Iraqi prisoners in the Abu Ghraib prison. An Islamist Web site that posted the video attributed the killing to Musab al-Zarqawi, a jihadist that the U.S. has long said is behind attacks in Iraq. In other news, U.S. forces attacked a mosque in the holy Shiite city of Karbala Tuesday in the largest assault to date against the forces of rebel Shiite cleric Moqtada al-Sadr. 13 Mehdi Army militiamen were killed in overnight clashes on the outskirts of two other southern cities–Najaf and Kufa. Until now, American forces had kept out of Karbala and nearby Najaf for fear of provoking further Iraqi resentment against the occupation. The U.S. assault came as the first signs emerged of a peaceful resolution to the five-week-long standoff with Sadr. A statement issued by Muqtada’s office in Najaf suggested that he would end his insurgency on condition that the Americans agree to direct negotiations with him. The US has so far rejected that demand. Meanwhile, hundreds of people marched in Najaf on Tuesday calling on Sadr to pull his militia out. Some of his supporters fired in the air over the crowd after the majority of marchers had dispersed. We are joined by Gen. William Odom who is considered to be the highest ranking retired general calling for U.S. withdrawal. AMY GOODMAN: We welcome you to Democracy Now!. AMY GOODMAN: You have called for U.S. Troops to withdraw from Iraq. Can you explain why? LT. GEN. WILLIAM ODOM: Yes. Because I don’t think they’re serving any U.S. interests there. I don’t think that the war serves U.S. interests. I think Osama bin Laden’s interests and the Iranian interests are very much served by it, and it’s becoming a huge drain on our resources both material and political. And our ability to keep our alliances with Europe together and eventually to bring some kind of stability to the region from Afghanistan to the Eastern med and to more effectively cope with Al Qaeda, we’re going to have to get out of this resource consuming pothole. 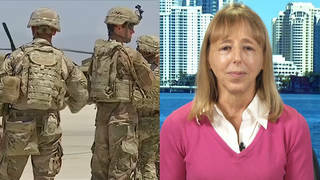 AMY GOODMAN: We’re talking to Lieutenant General William Odom. Can you talk about how prevalent your view is? You are one of the highest ranking people ever to come out against Iraq, the U.S. troops in Iraq, serving as the director of the National Security agency under Reagan. LT. GEN. WILLIAM ODOM: Well, let me just make the point —- you know, I served in the Carter White House and the Reagan White House. The presidents I served under don’t have anything to do with my politics. I have never belonged to a party. I don’t have party affiliation. I was selected to that job by the Joint Chiefs of Staff have voted me out in the Secretary of Defense and the president approved me and the Senate confirmed it. So, don’t draw any conclusions to my political standing one way or another. And I don’t care which— I think the present president, President Bush, is in the best position to do something about this in the near term and probably it will be more effective if he did rather than wait to change to another administration to do it, but that’s beside the point. Also, General Zinni, who commanded central command, was very much opposed to the war in the first place, as I was. We were both quoted to that effect in February of 2003. So, I will say that — I have been one of the first people to begin to raise this issue again after the war started. And I have raised it because I hear a large number of people that are not in the total of the U.S., but, you know, dozens of people I know were very much like to debate this. They’re skeptical about what’s going on. But there’s a climate of you can’t question this issue at all over the past year. So, it’s my hope that others will follow this lead, and at least have an honest public debate. I remember serving in Vietnam in that war, and many of us at the major Lieutenant Colonel, colonel level were frustrated that no one in the U.S. wanted to debate it that way. What happens is that it ended up getting polarized where you had a war movement, who is an anti-war movement whose goals we didn’t sympathize with, because they came from a ridiculous political position. There were others of us like myself who recognized that containing china was a Soviet objective and we didn’t understand why we should submit half a million U.S. troops in U.S. support of Soviet objectives. Tragically, it seems let’s a bit of an analogy here. I don’t see why U.S. forces should be achieving Osama bin Laden’s goals by overthrowing secular Arab leaders or dealing with Iran’s enemies. AMY GOODMAN: We’re talking to Lieutenant General William Odom, served as director of the National Security Agency under president Reagan from 1985 to 1988. We’ll come back to him in just a second here on Democracy Now!. When we come back, we’re going to go to the hearings yesterday. The army General Taguba, who testified who investigated the prison abuse scandal. This is Democracy Now!. Back in a minute. AMY GOODMAN: This is Democracy Now!, the war and peace report. I’m Amy Goodman as we continue our conversation with Lieutenant General William Odom, served as director of the National Security Agency under President Reagan from 1985 to 1988, was also Assistant Chief of Staff for Intelligence, the Army Senior Intelligence Officer, one of the highest ranking people in government to come out against the invasion of Iraq. How prevalent is your view among your colleagues? LT. GEN. WILLIAM ODOM: That’s hard to say. I hear from quite a few people, and I hear from the ones who obviously support — share my view. I don’t hear much from others. So, I cannot — you know, I can’t give you a valid statistical-an unbiased statistical assessment on that. I think a lot of people are skeptical. Many of them may not have gone as far as I have and thought it through and reached an ambiguous conclusion. Very many, even those who are not quite ready to go all the way at my decision have told me that I really provoked them to think and have considered it. So I think it’s a position that will gain in numbers of people fairly rapidly. AMY GOODMAN: John Kerry has called for an increase of troops in Iraq-you’re calling for the opposite. LT. GEN. WILLIAM ODOM: Well if we want to prevail there in the sense of restoring the insurgency and bringing some sort of order in governing the country, he’s absolutely right. We went in with far too few troops. In World War II in Germany, we had a ration for one U.S. soldier, or one allied soldier for every twenty inhabitants. The ratio in Iraq is about one for a hundred and sixty. So the numbers are very much against you there. The marines went in and started a fire fight which they didn’t have to start in Fallujah which kicked off a conflict there which they were very much outnumbered. The 82nd airborne tried to explain that to them, and they couldn’t be told. They had their own ideas how they were going to pacify. The result has been that they are now facing a hard truth. They just had to agree not to go in and put down this group that was causing the trouble. And if you are going to do that, you are going to have to have a lot more troops, and what I™fm suggesting is continuing to do that is — promises little or no positive outcome in the near term. Promises much larger-requirement for much larger commitments later on. Therefore its not in the U.S. interests. But, if you are going to do that Kerry is absolutely right. AMY GOODMAN: Lieutenant General William Odom, the top retired U.S. General calling for the withdrawal of troops from Iraq. Do you think that Donald Rumsfeld should resign? LT. GEN. WILLIAM ODOM: No, because I am an ex— a former serving military officer, I don’t think I really ought to comment on that and I’m not going to. I will make a general statement that we have not had anything like the policy of holding people in high office responsible for their acts that I think we should. One only has to ask what would happen if a Naval Commander ran his ship aground or if an army officer had some egregious thing occur in his command like this brigadier General Karpinski has. One can draw one’s conclusions of what ought to happen in that regard. Just let me add, in the case of naval commanders running aground nobody asks them anything. They don’t look to see whether it was somebody else’s fault on the ship. AMY GOODMAN: Do you — what is your view of the media and how it has discussed the invasion and occupation of Iraq? The diversity of opinion, for example, or a lack of it. For example, in entertaining the idea and discussing, analyzing the idea of a pull-out, as you are proposing? LT. GEN. WILLIAM ODOM: Well, I — let’s put it this way, I cannot complain that I have not had an opportunity to express my view on national television, and “Wall Street Journal” published a piece describing my view. I have not tried to publish anything myself yet. So, I cannot say that the media is turning it down. What struck me about the media at the beginning of the war was that it really didn’t carry the opposition very strongly. But more disturbing, the press can only go so far on these issues. The really disappointing thing was that it was almost no serious discussion in the Congress opposing the questions like this before the war. Here I think the separation of powers is another failure and both parties have a lot of blame to share on this particular issue. It’s just been — it seems to me a tragically inadequate dealing that —- what the consequences would be of going to war, the way we did,—- in March of last year, and say it was just — it was very unpopular, and in fact — it was almost a climate of we’re not allowed to speak an honest opinion here. You really — you are somehow Anti-American if you use your rights to speak out. AMY GOODMAN: Lieutenant General William Odom, I want to thank you very much for being with us, top retired U.S. general calling for U.S. troop withdrawal from Iraq. This is Democracy Now!, Democracynow.org.